Have been building up to this one for a while and was super excited for my first attempt at the 100 mile distance. With 7000m of ascent/descent mostly on rough single tracks, it’s a pretty challenging course – but my theory was that the variety of terrain would justify lots of walking, so while it would take longer, it would actually be more pleasant than 100 miles on flat-ish terrain. History/info/links on AURA. 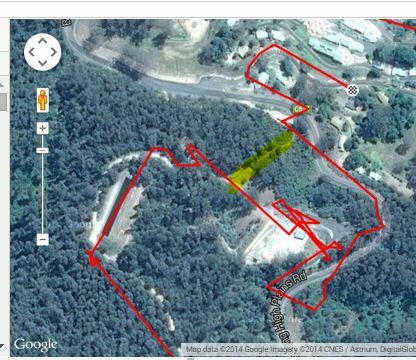 The basic outline of the course can be broken into 6 climbs, 6 descents and 2 flat sections. It includes almost all of the Bogong2Hotham and Razorback 64km courses, added together, plus a couple more bits (see map on strava). The course is mostly unmarked, so you have to follow the appropriate walking tracks and pick the correct path at junctions, but it definitely helps to know how to use a map and compass! This area is incredibly amazing for training and racing, in terms of physical challenge as well as being a beautiful environment. There are a number of check-in points along the course (shown as red dots on the elevation profile above), so I was able to compare the 2012 and 2014 check-in times. 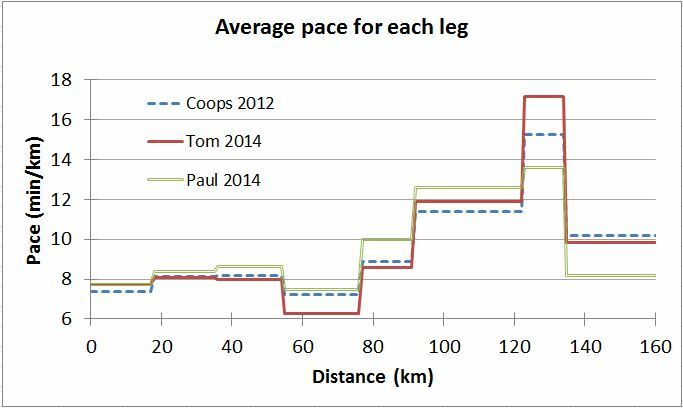 Interesting to see the radically different pacing between Paul and I this year, and again with Coops’ 2012 record time. Yet we all finished up close together. 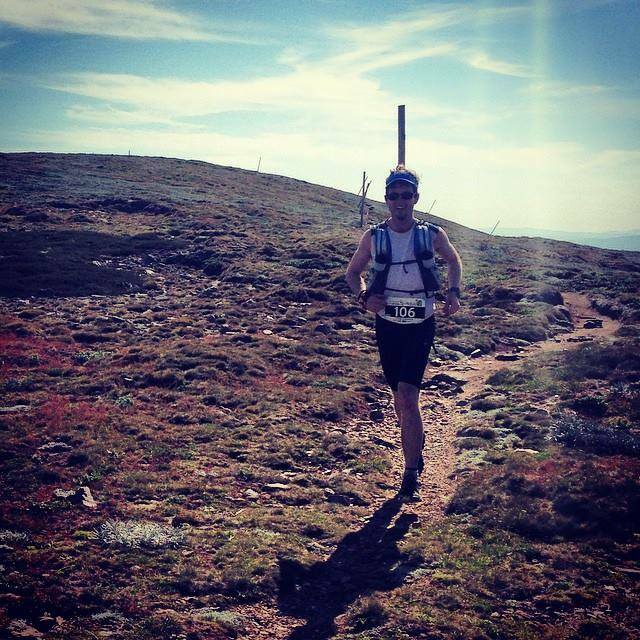 I had a strong start all the way through to Hotham/Mt Loch, then slowed dramatically relative to the other guys. My section on the high plains from Cope Hut to Pole 333 was even a few mins faster than during B2H earlier this year (whoops!). 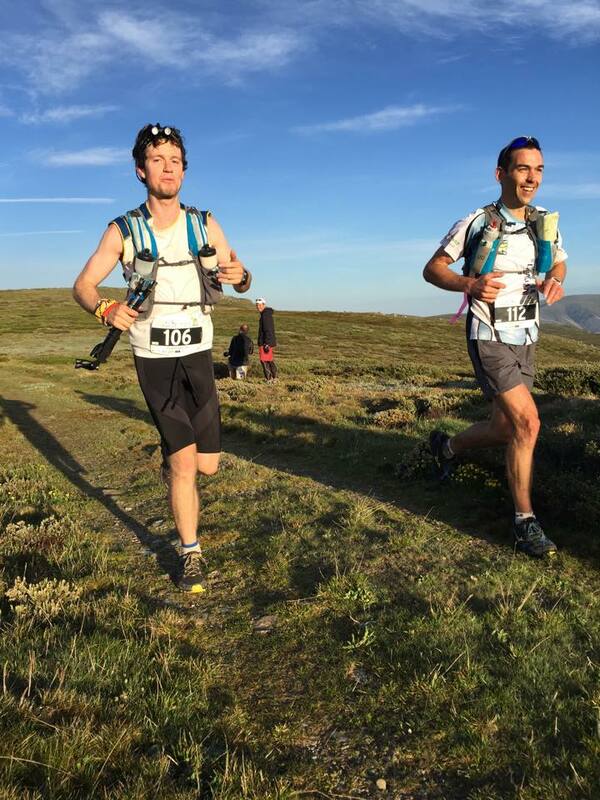 Paul absolutely dominated the finish from Feathertop summit to Bogong Village, and Coops’ record is a balanced version in between our two extremes. 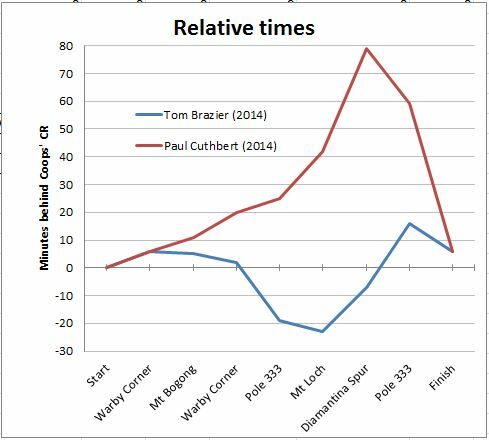 In hindsight my last few splits were a little disappointing after such a strong start relative to the course record – will have to come back next year! 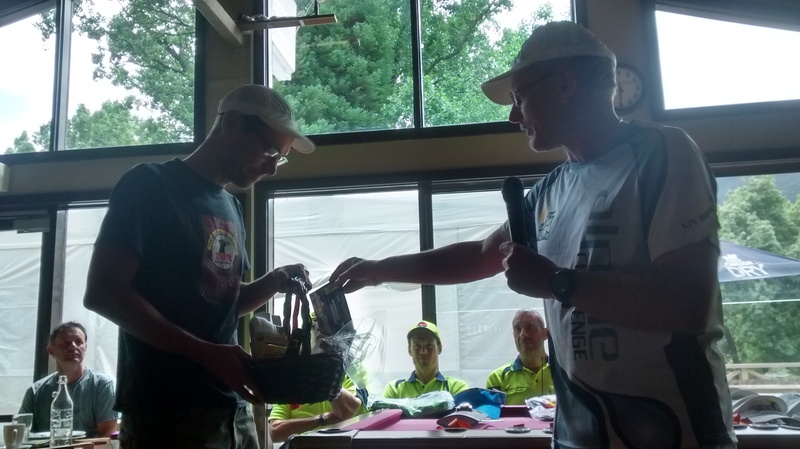 Our joint win at the finish inspired a bit of banter about the idea of handholding and sharing victories – whether it’s good sportsmanship or just being soft. I think it totally depends on the context of each race. I’ve had a lot of sprint finishes in the past – e.g. Glow Worm Trail Mara and Bush Capital Half Mara this year – both of which involved intense battles for 5km or so before I snuck through and won by less than 30 seconds. I’ve never considered a joint finish before, but both of those races had a gauntlet style finish that was obviously marked and impossible to get lost on (also my brain was probably a lot fresher after running for 1-3hrs instead of 25hrs). The way this race unfolded, I took off on the first descent to Big River to get away from Paul Cuthbert and Damon Goerke, then continued to put time into the other guys for the first 2/3 of the course, reaching a maximum lead of around 1-2hrs at Mt Loch and Harrietville. I had minimal info about how the others were going and didn’t see anybody for ages. My theory was that I felt good, so should continue to move as fast as possible without pushing my limits past what was comfortable. 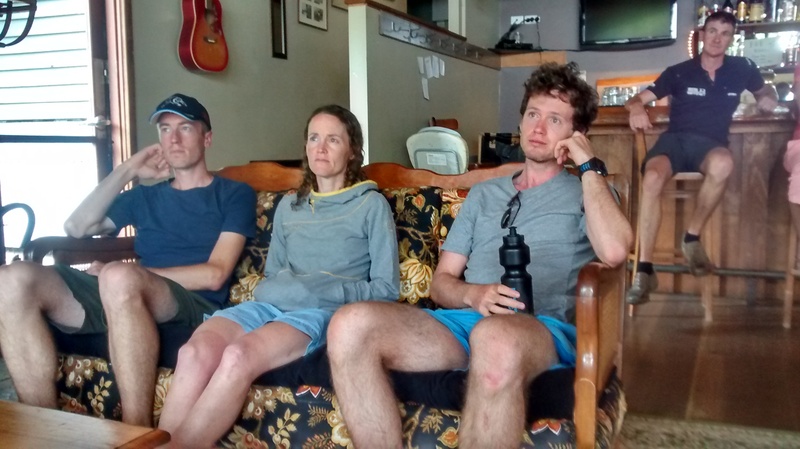 As we moved into the final 30km, I really started to struggle with tiredness and a combination of little niggles (bruised feet, chafe, sore ankle, etc.). Nothing debilitating, but I slowed down, whinged a lot to my pacer, and insisted that it was safer for me to walk instead of run because I wasn’t coordinated enough to avoid tripping over on the rough ground in the dark. Given that we couldn’t see any chasers, my fatigued brain decided it would be a good idea to protect my body and cruise home to the finish. In the wee hours of Sunday morning, after almost 24hrs of racing, I finally saw another competitor! Paul came up behind us, saw me hobbling like a cripple, and offered a genuine “I’m really sorry, you poor bugger”. We were both surprised to see each other. Then he sprinted past – which is usually the best strategy to break someone’s spirit and discourage them from chasing – when you see that the other person looks so much stronger than you. I decided to give chase – I had to at least try – I had worked so hard for this lead and I sure as hell wasn’t going to lose it without a fight. Luckily we had clarified the rule that pacers and runners WERE allowed to split up, so Mel let Paul and I hurtle down the hill like crazy idiots and she followed at a comfy pace. In that split second things got really intense. Paul and my pacer, Mel, both thought that I would only last for about 50m of chasing before giving up. 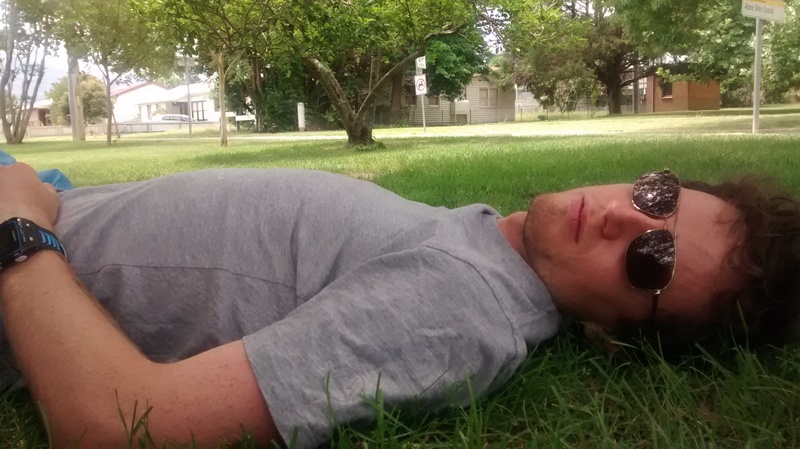 However, 4km later, I was still hanging on to Paul’s tail, sitting about 5m behind him. All of my niggles seemed to disappear with the single minded competitiveness of trying to beat my friend. Neither of us had time to check maps or be careful – we were banging down the final descent like crazy people. I think my km splits were something like 10/12/10 before Paul arrived, then all of a sudden we were pulling 4:30’s at the 155km mark, I couldn’t believe it. My plan was to hang on until we could see the finish line, then try to out sprint Paul in the last 200m – I didn’t want to risk getting lost. Paul suddenly backed off a bit and I took the lead, then starting creeping ahead until I was out of sight around each switchback (maybe 50-100m), so I started to think I had broken him and had it in the bag. I was being really careful not to trip over as the dawn light began to flood the rough fire trail, and hoped that the final road down to the finish would be too obvious for me to miss. All of a sudden, I found myself next to a shed, inside a locked gate + barbed wire fence (see map above) and started panicking – I must have missed a turnoff. What if Paul and Mel both overtook me and were already at the finish? While I frantically hunted around for a path (see all the little squiggles back and forth), I heard people approaching. First Mel, then Paul, joined me and began looking for the path. So we had all missed the turn independently. 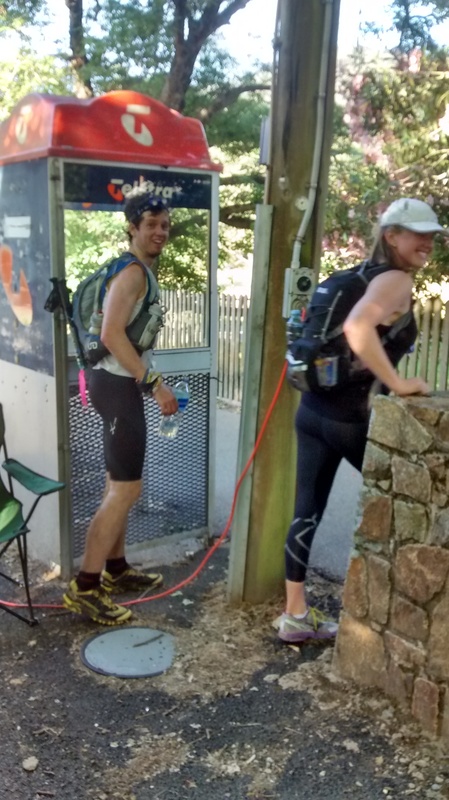 We couldn’t figure out where it was, so we decided the best option was to adjourn our battle, slide underneath the locked gate, and take the slightly longer but guaranteed route around the road to the finish line, where we crossed together. I am stoked to have shared the victory with such a great bloke and runner, and totally comfortable with our decision. I set up a big lead over the first half of the course, and Paul smashed everyone over the back end of the course, so we both earned it independently and it’s a pretty huge coincidence to be that close at the finish. Also we ended up 5mins outside the course record so I guess we will have to come back next year! 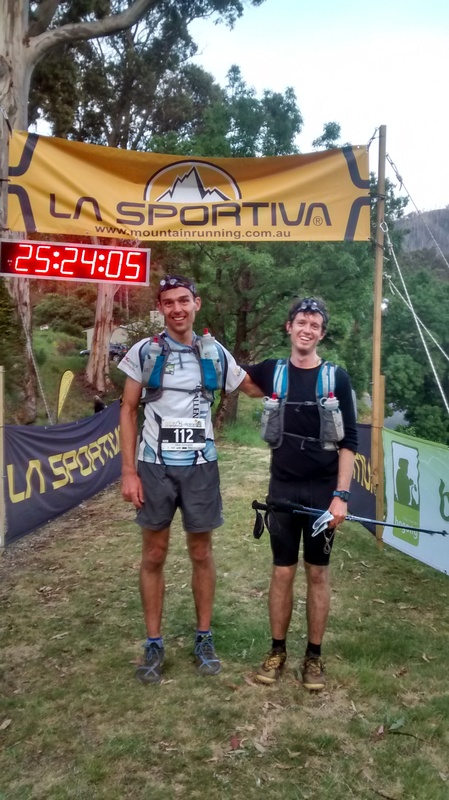 About an hour later, another genuinely friendly bloke of trail running, Dan Beard, PB’d by a few hours to come home for 3rd, followed by La Sportiva teammate and hero Gill Fowler for 4th overall and a massive win in the ladies field. Black Diamond Ultra Distance trekking poles – hence forth christened as my “misery sticks”. This was the first time I’ve raced with poles, and they were absolutely amazing. I used them to walk up every major climb, then folded them away for running the flats and downs. For the last 40km, they didn’t leave my hands regardless of the terrain – by this point I had lost faith in my coordination ability to balance and stabilise on one leg! My triceps were a bit sore by the end of the race but my leg muscles felt surprisingly good so I’m going to credit some of this to the misery sticks! La Sportiva Helios (4mm drop, light weight) for the first half of the course – we had several river crossings and I’m comfortable getting these shoes wet because they drain and dry so quickly, as well as being light. 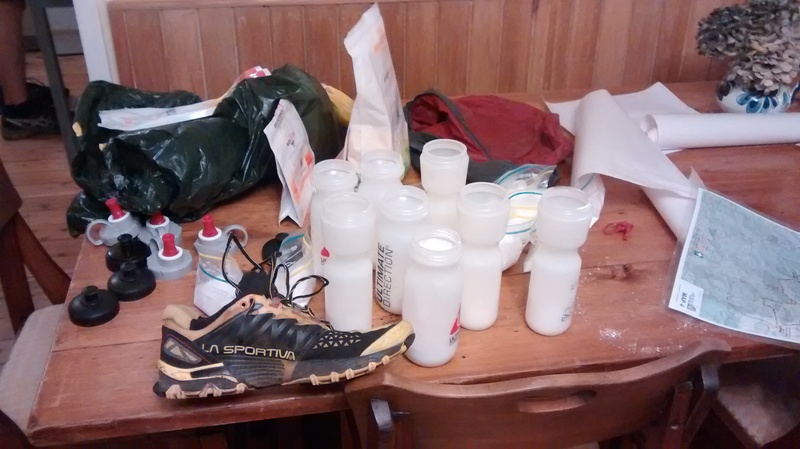 La Sportiva Bushido (6mm drop, medium weight) for the second half of the course – we were finished with the river crossings so fresh dry shoes seemed like a good idea. These ones are a bit heavier, with much more support and protection which I figured would help as my legs got tired and I lost my coordination under fatigue and started kicking rocks/sticks/etc. Ultimate Direction Peter Bakwin 12L vest. There was so much water available from creeks on the course that you never had to carry more than 1-1.5L of water. We mostly used purification tabs but sometimes got a bit slack. All the safety gear fitted comfortably in this bag. In hindsight, I should have used some lube on my back though – I’ve never had noticeable chafing before but haven’t really used it for longer than 12hrs before either! I was very disciplined for the first 2/3 of the race and stuck to my 200-250 calories/hr intake. This was split between home made 80/20 maltodextrin/soy protein mix, as well as a few LCM bars (super easy to digest). After I picked up my pacer I got a bit slack and just ate for hunger, but by this point I was moving so slowly that I think I would have been close to 90% fat burning and 10% glycogen usage. 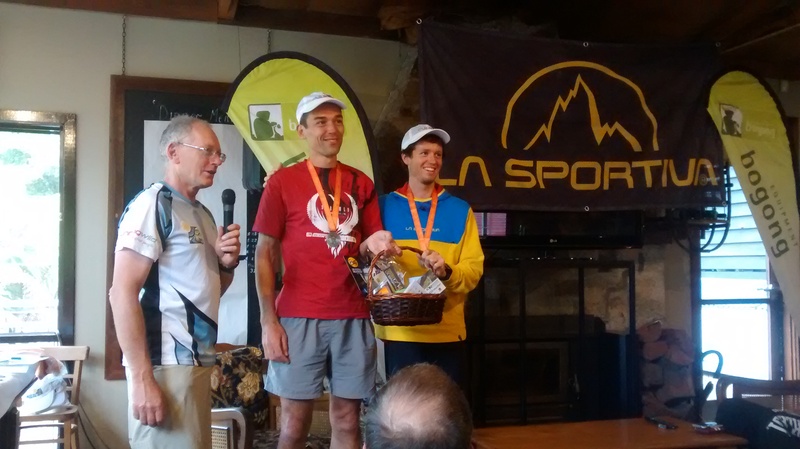 Congrats to Paul Ashton (Running Wild) for organising another successful race, and thanks to SARS (Vic Alpine Search and Rescue) who manned the checkpoints and La Sportiva/Bogong Equipment (Matt Adams, Stephen Upton) who sponsored the event (and me). Well done to all the finishers in this epic event. We were pretty lucky with the weather but it was an absolutely epic course and a huge effort to finish regardless of the times. It was brutally hot on Sunday when some people were still coming home across the high plains. Massive thanks to my support crew, Gay Robertson (/Mum), and pacer, Mel Kitchin, for doing everything they could to help me through the race. The support crew checkpoints were all during the first two thirds of the race, so Mum only saw me cruising through feeling strong. However, Mel accompanied me for the final third of the race, so she definitely copped a lot of fatigued whinging about my bruised feet, sleepy eyes, worsening chafe or negative estimates about how long it was going to take us to walk home to the finish at 4km/h.